If you’ve got a portable home sauna, you know that the included chairs are not amazing. An attractive wooden sauna chair will certainly make you feel more comfortable! After a thorough examination of several shower and sauna chairs, I’ve found that the best sauna chair is EcoDecor’s Serenity Shower Stool. It checks off every conceivable mark one might think of when shopping for a sauna chair: quality construction, a heavy and strong feeling to it, and appealing look. Made from plantation-grown, sustainably-harvested Indonesian teak, the EcoDecor will last a long time no matter what use you put it to. For more information on the Serenity Stool, see below. The runner-up for best sauna chair was yet another teak chair: Paradise Teak’s shower seat. Similar to EcoDecor, it’s sourced from responsibly grown Indonesian plantation teak. While it doesn’t have a convenient storage shelf, it makes up for it with its high-quality build, ease of use, and overall appealing look. For further details on the Paradise Teak sauna chair, see the Product Reviews section below. ETECHMART’s Bamboo Folding Stool is a smaller sauna chair made of high-grade bamboo. It’s compact size and ability to fold with ease make it a great choice for someone who only wants to use it occasionally. It has a slightly lower weight capacity than most of the other chairs on our list, so be sure that it is appropriate for you and whoever else will be using the chair in the sauna! For a complete review of the ETCHMART, see below. Sitting in a sauna can be one of the most relaxing and invigorating activities you can do. If you have a two-person sauna, you probably already have all the seating you need, but if you’ve got one of the one-person, portable infrared saunas, you know that the seating situation is not ideal. The seats for these saunas are more akin to folding camp chairs than spa seats and given you’ll be sitting in the sauna for 30min or more per session, it definitely makes sense to get a more comfortable sauna chair. Here are a few important considerations when shopping for a sauna chair. Most sauna chairs are either bamboo (low end) and teak (high end). Teak is a nicer, higher-quality wood that makes for a better chair. But bamboo is quite eco-friendly, strong, and works just fine for sauna chairs and benches. There are lots of reasons why someone might forgo a higher quality teak chair in favor of a material that is sometimes lower priced, such as bamboo. Perhaps recent injury requires immediate and temporary need of a sauna chair. Or, you might be looking to gift one as a present for the holidays or a birthday. Whatever the reason, it’s worth noting that bamboo chairs are still good for the long term but may need some additional care to help them resist mold and mildew, which can pop up 3 to 6 months if left continually exposed. Some sauna chairs will fold up for storage, while others are designed to be benches that don’t fold up at all. Both can be useful, depending on your needs. If your portable sauna is typically used in your bathroom, you may want to get a non-folding bench and use it in the shower during that time, and then bring it into the sauna for use there when you use the sauna. Alternately, you can use the benches for storage of towels and other items when you’re not actively sitting on them. If you’re going to be moving your sauna chair around a lot, you’ll want one that’s not too heavy. Those who figure they’ll mostly keep it in the same place probably won’t care so much about weight, but it can be an important considerations. Be sure you consider the weight capacity of the chair. Where published, I’ve included the weight capacity in the listings below. 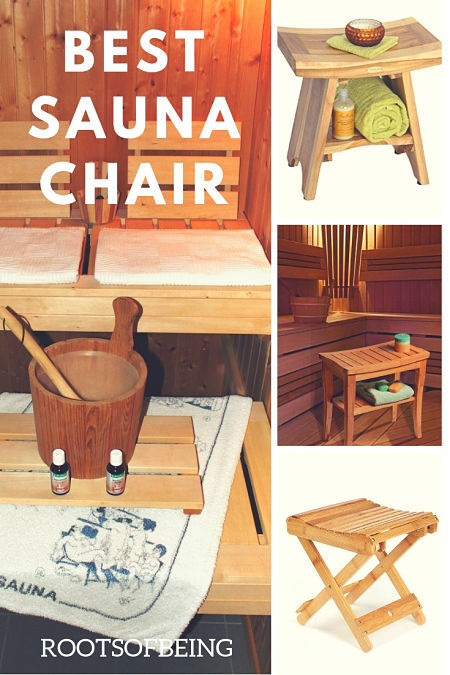 Sauna chairs can serve as chairs for your sauna, decorative pieces, extra storage for shower accessories, or as a simple seat to sit in and relax during a hot shower. If you’re looking for a sauna chair that is attractive and appealing, while bringing natural color to your bathroom, then wooden chairs are the way to go. They offer the same practicality as metal chairs with wooden accents to bring the calm, and don’t stick out like a sore thumb like metal chairs tend to. The two categories of chairs that I’ve looked at were teak and bamboo. Teak is the best option on the market when it comes to long-term use (12+ months) as it is extremely resilient to mold and mildew. As it ages, it changes colors but retains an attractive look. We’ll start with a comparison table to get oriented, and then go in detail into each sauna chair. We’ll conclude with our findings. This bench/mat combo brings to the table additional functionality and it’s appealing look allows it to be a great fit in almost any bathroom and sauna space. For more warranty information, contact the seller directly on Amazon. There is a stated 30-day no questions asked warranty. The Bambusi shower and sauna seat bench serves multiple purposes, making it an appealing choice for those who envision their chair doing lots of different things. Of course, it can be used in the sauna. Beyond that, inside your bathroom, you can use it as a comfortable seat while showering or shaving, or you can use it as an accessory piece that holds your towels with its convenient shelf. Additionally, it can even be used as a seat for gardening or doing handy work around the house in lower-to-reach areas. The bench seat part is slightly curved, making it pretty comfortable to sit on for reasonable periods of time. It’s not perfectly level, and I wouldn’t put a tall wine glass down on it, but it’s not so out-of-level as to be a problem when used as a table. The floor mat shares this flexible use design in common, as it can be both a decorative piece as well as a sturdy floor mat while getting in and out of the shower, or used in the sauna to keep your feet off the floor. Aesthetically, this should fit most showers and saunas: its authentic bamboo construction is a welcome sight. The antibacterial and antimicrobial properties inherent to bamboo should help resist mold and mildew. However, with that said, be sure to let it dry out if it’s seeing heavy use, as some users have found some mold and mildew on this seat regardless. One note some small number of customers have reported not receiving their mat at all. That seems to be the only noticeable issue with this package. If that happens to your order, contact Amazon and the seller directly to get the mat shipped out. Overall, the Bambusi sauna chair and mat set is suitable for most needs. It’s not a budget option, but it’s certainly not the most expensive option either. And the bonus, matching mat should have plenty of uses as well. With eco-friendly bamboo construction, easy installation, and safe design, this is overall a great shower bench and sauna chair. Multi-purpose use: shower, spa, sauna, balcony, deck, etc. For warranty information, please contact the seller directly on Amazon. Artmeer’s sauna and shower bench seat is pretty similar to the Bambusi above, though it has handles on each end to enable users to easily move it wherever needed. It also is a bit more curved, making it perhaps a little more comfortable to sit on, but maybe a little less stable as a table. Functionally, the Artmeer focuses on a safe design that is easy to use: the anti-slip rubber feet help it stabilize on any surface it’s used on, the round corners make it more forgiving to bumps and scrapes, and it is noted to have been designed with stability in mind. This is an important feature for a chair which will see use in slippery places like saunas and showers. When it’s not in use, try to keep it out of the shower or sauna so that it can dry, which will help ensure its longevity by aiding in the prevention of mold growth. 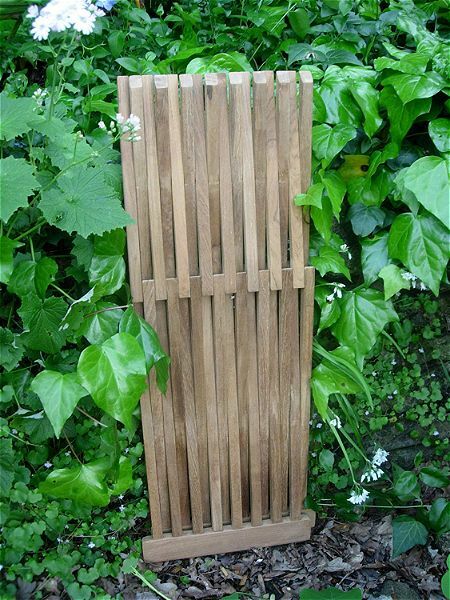 If you’re interested in any accessories which can benefit this bamboo sauna chair, teak oil can help bring out the finish and maintain this, especially with long-term repeated use. Assembly-wise, Artmeer’s shower bench is very easy to get ready to use. It arrives with one Allen-tool similar to many Ikea products, and an instruction manual to ensure proper setup. Just follow the instructions and it should be ready for use in under 30 minutes. There weren’t many downsides reported with this sauna chair, but one issue that was noted a few times is that people were having problems assembling due to the fact that holes weren’t lined up. To mitigate this, get each of the bolts started, and then do a second round to tighten everything up. This will ensure that the bolts are all lined up properly. Looking at the range of sauna chairs to choose from, this leans towards the budget category, despite its quality appeal and multi-use functionality. Bamboo, in general, is always a bit less expensive than teak, while still being suitable for the environment it’s being used in. The bottom line is if you are looking for a simple sauna chair without any bells and whistles, this chair is a decent choice. 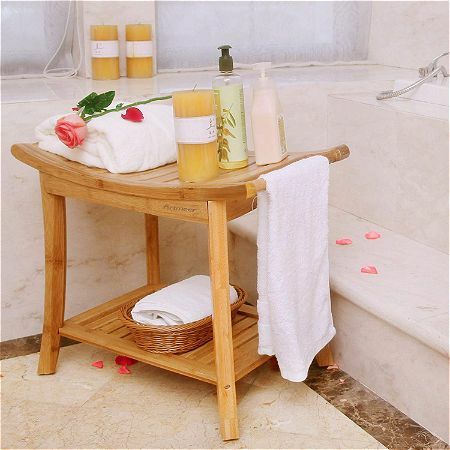 WIDELY USE:The shower bench adult in bathroom,bathtub,or vertical,ideal for bathroom,indoor or outdoor use (shower, spa, sauna, balcony, deck, RV, Sofa,patio,lawn),etc. STABILITY:This shower seat is able to stand shower use and provides extra stability while in use. SAFE DESIGN:With its smooth surface, countersink screws and round corners,this rack will not cause harm to your belongings or your children.The storage bench is one of the best choice as as gift. The first of two teak sauna chairs that we look at, it stands out among the bunch as top tier both in terms of design and looks. For warranty information, contact the seller directly on Amazon. The ParadiseTeak folding bench chair is a beautiful, functional piece of furniture that can be used in the shower, in the sauna, and even outdoors! This piece is made of Solid, Grade A Indonesian Teak comes in a contemporary design that is quite attractive. Supporting up to 325 pounds, this teak sauna chair is tightly-built and can serve the functionality aspects of sauna chairs efficiently. You can have comfort in knowing that it will never break or fall apart from weight or pressure alone. As this unit is made from teak, it’s important to note that you have a few options to go when choosing to maintain it. Similar to bamboo, which is resilient to mold and mildew, teak is the same – but even more so. You generally don’t want to use teak oil on teak, but rather you want to use a teak sealer. 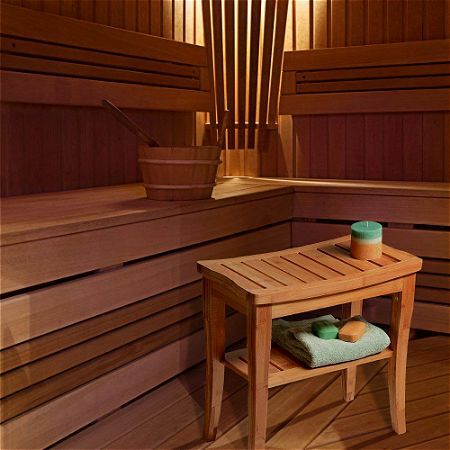 See this guide to caring for teak products used in wet environments like showers, saunas, and outdoors. Previous buyers have noted that it’s easy to fold up and put away when not in use. It doesn’t take up too much space but the seat may be a bit high. This shouldn’t come across as an issue for most unless it’s being used to shave one’s legs, in which case it’s worth considering the seat height is 17” tall. For its price, this is one of the best sauna chairs available in the market. Its responsibly sourced teak wood sets a high standard. It’s easy to use, folds up nearly flat, and its overall construction makes it very well made. This is the best sauna chair, and is a great folding chair to have on hand for a variety of uses, both indoors and outdoors! Dimensions: 15 1/2" Wide x 12 3/4" Deep x 17 3/4" High, Holds 225 lbs. 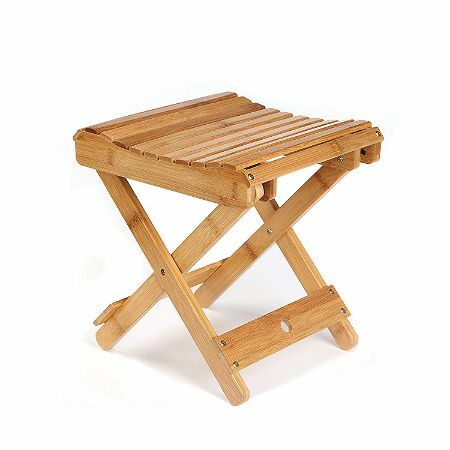 For someone looking for a super simple, low budget option for their sauna or shower, this bamboo folding stool by ETECHMART is the way to go. With no assembly required, all that is needed to get the ETECHMART bamboo sauna chair ready is to take it out of the box, unfold it, and you’re ready to get warmed up! Functionally, this bamboo bench should suit most people’s needs, but it’s worth noting it has a stated maximum weight capacity of 200 pounds. This is pretty low and may be too low of a requirement for some users. It’s easy to use and easy to fold, but some have noted that there’s a bit of stickiness when opening and closing it. This is usually a minor annoyance rather than a core functionality issue. While the ETECHMART is made of bamboo, it does have a varnish on it that should help preserve its finish even in wet areas. it’s hard to compare it quality wise to some of the more expensive teak-made sauna chairs, but it’s compared to it’s fellow bamboo chairs, it is just as suitable. It’s a bit on the smaller side overall so be sure to take that into consideration when making a choice. Given the price point this unit is positioned at, and the low weight limit, this chair is clearly a step down in quality from the top end Teak chairs, and even the more expensive bamboo options. But it is priced really attractively, and if the weight limit works for your needs, it’s a great choice for those on a budget! It’s also a great gift, and will almost certainly get used quite frequently in the sauna or out of it. 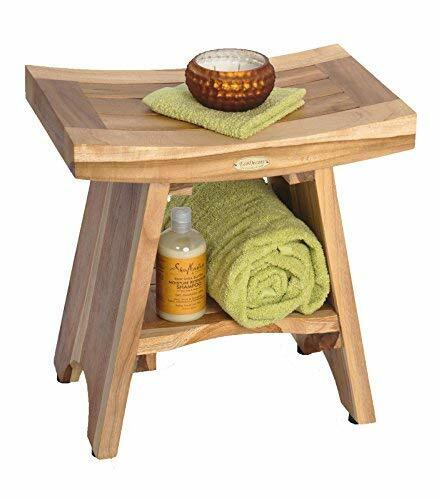 Fits neatly in bathroom to prop your feet up in the shower for washing, shaving or foot rest. 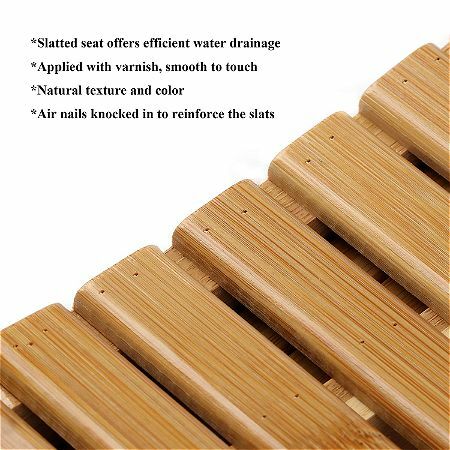 Slatted seat, applied with a cap-a-pie varnish, offers efficient water drainage and air exchange, prolongs life span even in moist places. Accented with compact size and foldable design, it won't take up much space, ideal for spacious places. Crafted from eco-friendly and renewable bamboo, it adjusts humidity, absorbs UV rays and reduces noise, good for health care in daily life. Bamboo structure also makes it heavy duty enough to use as a stool for kids if needed (holds 200lbs). Coming fully assembled from plantation-grown teak, this is an extremely high quality and attractive sauna chair. A manufacturer’s warranty can be requested from customer service. The EcoDecors serenity chairs has a stunning design, and the teak wood looks exceptional It is surprisingly solid and heavy, coming in at 21 pounds — almost twice the weight of some of the other chairs reviewed so far. This gives a feeling of powerful sturdiness, but that also means that the EcoDecors is a bit of a pain to move around. This chair arrives fully assembled and simply needs to be taken out of the box to use. Like Paradise Teak’s teak sauna chair, this seat is made from responsibly-sourced teak wood grown on plantations in Indonesia. This is a sustainable process which means these can be made without harming existing forests or wildlife. Functionally, it up to almost any task that you set it to. Its sleek design allows it to fit in the shower or sauna comfortably, with an extra storage shelf that can accommodate shower needs, or store towels or other materials for the sauna. If your shower has a sloped floor, simply adjust the foot levelers to ensure the seat is balanced when you use it. Like the other teak sauna chair, it’s important to decide how you want it to look in 6 months to a year. As mentioned above, it’s a good idea to seal this with a teak sealer from time to time if you want to keep the finish the same. Without sealing, it will slowly weather to a silvery patina. Check out this guide to teak sealers for care and feeding information. The EcoDecors sauna stool is a heavy-duty, compact teak chair that is created by a small family-run business using sustainable methods. Sounds perfect! If you are just looking for something more temporary, say because of a recent injury, then you may want to look at a budget option instead. When it comes to sauna chairs, there’s no shortage of options to choose from. Varieties range from plastic to metal, to various woods which I’ve focused on here. Choosing from a teak or bamboo sauna chair gives it the ability to function as both a useful stool to an appealing accessory piece for your bathroom, and perhaps even outdoors. The two best sauna chairs that I looked at both happen to be made of teak. Teak is well-known to be almost “invincible” to water and the humid environment that saunas and showers can be. Bamboo is certainly resilient as well but may require some additional care, such as refinishing, to prevent mold in the long term. 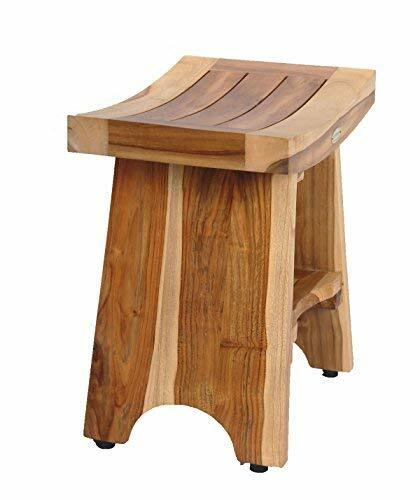 EcoDecor’s Serenity Shower Stool is the prime example of a shower stool that is built to last. Sourced from responsibly-grown teak plantations in Indonesia, it comes in as our top choice for sauna chairs. It feels heavy (and is), looks great, and will fit most showers or saunas. Not far behind is Paradise Teak’s teak wood folding shower seat. This is a great option if you are looking for a teak chair that folds for easy storage. 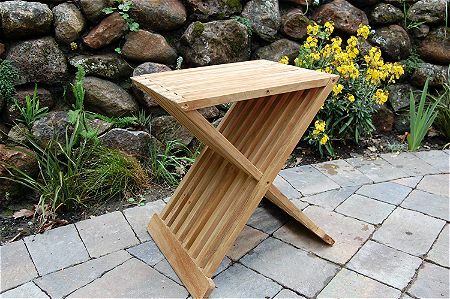 And if you’re not interested in spending a lot of money on your sauna chair, or perhaps are shopping for a gift, then ETECHMART’s 12” bamboo folding stool should come in a price point that’s easy to justify, while still hitting the marks on quality and functionality.